The Emily Carr community congratulates Samuel Lee and Cléa Lautrey, recipients of the Senior and Junior (respectively) Industrial Designers Society of America (IDSA) NW Student Merit Awards. 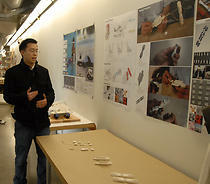 Their work was selected by an independent jury of professional designers in Seattle, Washington. Samuel presented his work at the Western Design Dialogue Conference earlier in May along with Senior Merit Award Winners from Western Washington University and University of Washington. Cléa will present at the regional junior banquet, to be held in Seattle,WA, June 1, along with Junior Merit Award winners from Western Washington University and University of Washington.